With all the hubbub about the upcoming holiday season, it’s easy to get caught up in Pinterest’s massive amount of multi-course meal plans. Holiday weight gain is mostly a myth – the average person gains only a pound over the season between Thanksgiving and New Years – but (scary!) often maintains this extra weight for the subsequent year. So, if you’re not careful, those turkey feasts and cookie exchanges can really add up. This week’s Seen on Pinterest highlights instead 10 filling yet simple to make winter soups that can help banish bloat as well as keep you full, warm and satisfied all winter long. Best of all? Many of these dishes can even be prepped in a crockpot, letting you wake up to something delicious for a work lunch or leaving you with extra free time for holiday shopping and more. 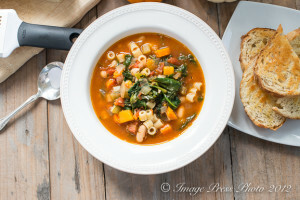 Ina Garten’s Winter Minestrone with Garlic Toasts has to be one of my favorite recipes ever. It’s hearty and filling, almost like a bowl of pasta, but without all the added calories. Roast Tomato Soup with Brown Butter Garlic Croutons has to be the best way to top tomato soup I’ve ever seen. There are lots of good soup recipes (I use Ina Garten’s tomato-basil one lots in the summer) but these croutons are too good not to share. Creamy Crockpot White Chicken Chili has all the flavors of some classic dishes, but uses fresh ingredients instead of canned soups and flavoring packets. Black and White Bean Soup with Sweet Potatoes will keep you full all day long thanks to a combination of protein and fiber. Baked Potato and Broccoli Cheddar soup combines two of our favorite kinds in a lighter-than-ever version, thanks to SkinnyTaste. Creamy Cauliflower soup is like a low-carb version of potato soup. At least everyone tells me that, trying to mash up cauliflower and call it “rice” or “potatoes” instead. But as a girl who usually says “no way,” I’ll take bread instead, this soup really is very, very good. Thai Coconut Chicken Noodle Soup is a dream come true for sick days. It combines the comfort of chicken noodle with the “sweat it out” factor of Thai food. Green Chili and Tomatillo Pork Stew can be made in a crockpot for an extra easy dish. Chicken Pho is pretty much the best food ever when it’s cold. Actually, it’s only better when you add lots and lots of spicy and sometimes sub beef for chicken. 7 Can Soup is for those days when you just don’t want to go to the store to make dinner. And hey, it’s pretty darn good, too. Have a favorite soup recipe? Leave the link or your details in the comments section!